Going to the dentist is a nerve-wracking experience for many people, and Dr. Gabriel Nossa is determined to change that. If our warm and welcoming atmosphere isn’t enough to help you relax in the dental chair, then we’re more than happy to provide sedation dentistry. These safe and proven techniques have been shown to eliminate both stress and pain so you can finally take care of your teeth in peace. Would you be interested in using sedation at your next appointment? To discuss your options, contact us today. 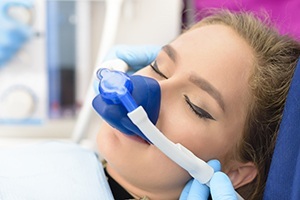 If you would like just a little help relaxing in the dental chair, let us introduce you to nitrous oxide sedation. With this approach, a colorless, odorless gas is inhaled through a small nasal mask to help a patient feel light, happy, and even euphoric while in the chair. The mask will stay on for the entire appointment, and once it is removed, the gas’ effects will wear off almost instantly, allowing a patient to quickly resume their day.